Just a quick post tonight, since I have to be up early tomorrow for my faculty meetings ... well, I guess I am up early every day because of, you know, the baby ... but at least the past few weeks I've been able to rest a bit. Tomorrow it's back to the old grind. For breakfast, I wanted to try something new-ish. 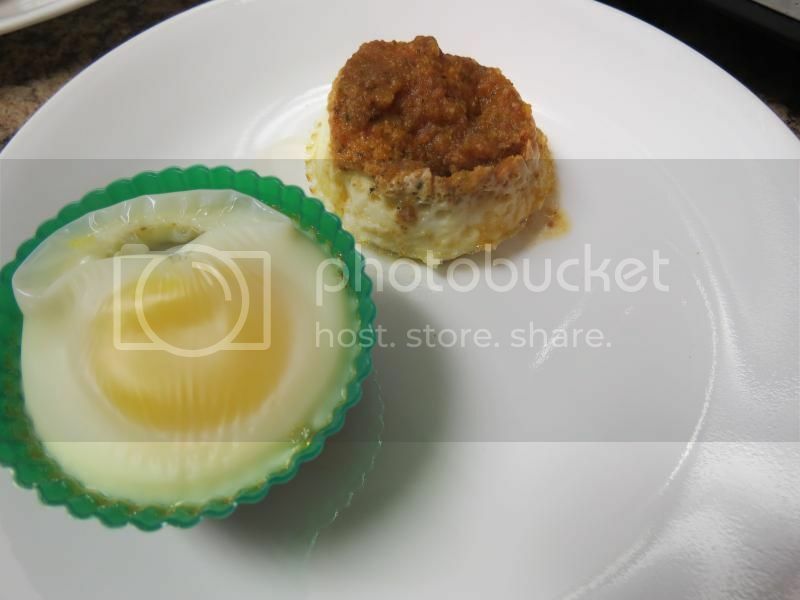 I love eggs poached in tomato sauce, but Matt, again, is a new and unadventurous egg eater, so I tried making them in my silicone baking cups. I put a bit of last night's tomato sauce in the bottom, then cracked an egg on top and baked it. 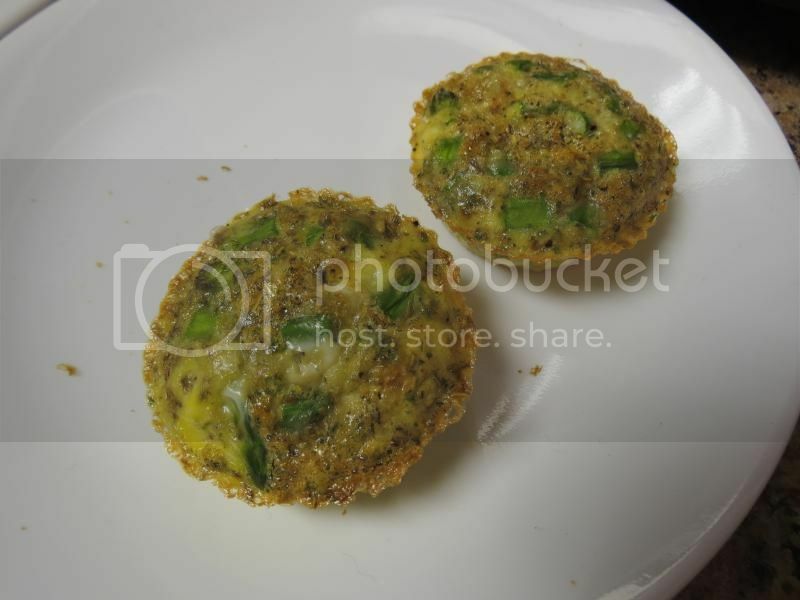 I also made some regular egg muffins, scrambled with asparagus, for Matt. They were delicious, very good flavor. I overcooked mine and the yolks were basically hard, but still, the sauce and the egg together ... you wouldn't think it's a good combination, but it totally is. Lunch was leftovers from last night's dinner - we had leftover spaghetti squash, but no meatballs, since I had only thrown a few together quickly. So a few hours after lunch, we found ourselves a bit hungry, and dinner was in the crockpot and a few hours away from being finished. 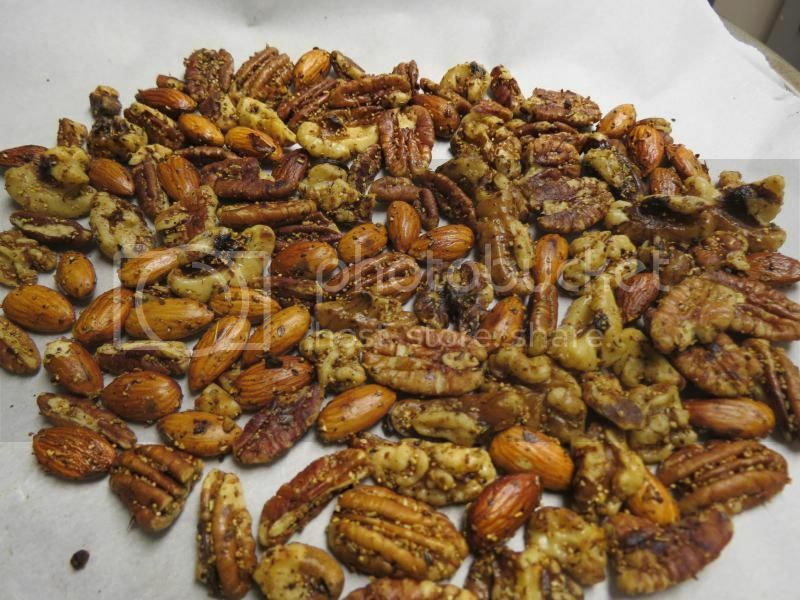 I decided to toast some nuts with assorted spices. Matt had gone to the store last night to pick up a few things we needed around the house, and he ventured into the grocery section with the nuts, looking for a snack. He picked up cashews and asked if those were okay, and I said yes, but only if they were raw or dry-roasted. They were roasted in peanut oil, however, and so they were a pass. Needless to say, my already-feeling-deprived husband wasn't pleased. So, I had him get some plain nuts and told him we would toast them ourselves. 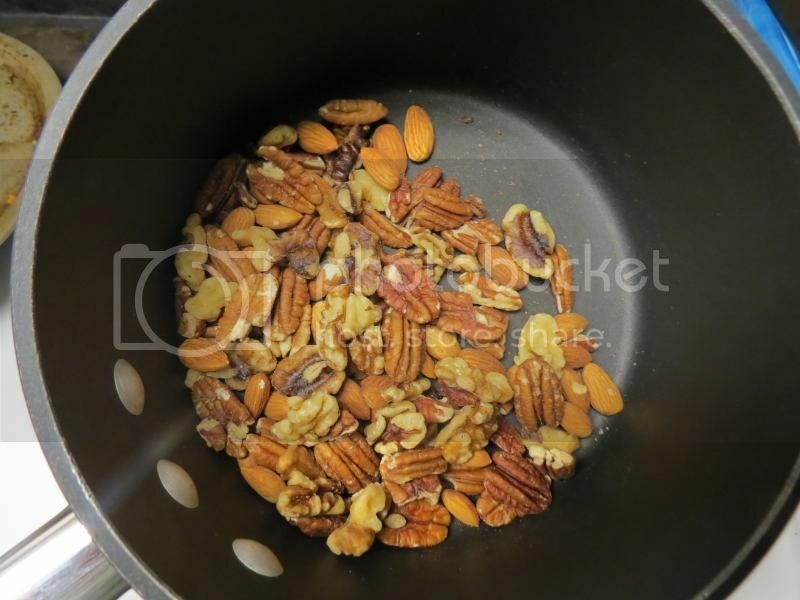 I took a few servings of raw almonds, walnuts, and pecans, and put them in a skillet. I kept them moving constantly over medium-high heat until they seemed done (very scientific, I know ... they smelled nutty but not quite burned). Then I added a tablespoon of mixed spices (garlic powder, onion powder, various peppers) and a teaspoon of olive oil, and tossed it all together. Then I poured it out onto a cookie sheet lined with parchment paper to cool down a bit, and there you have it - snacks! The spices were a nice touch, and it kept Matt happy for a little bit while we went to run some errands. When we got home a few hours later, it was dinner time. 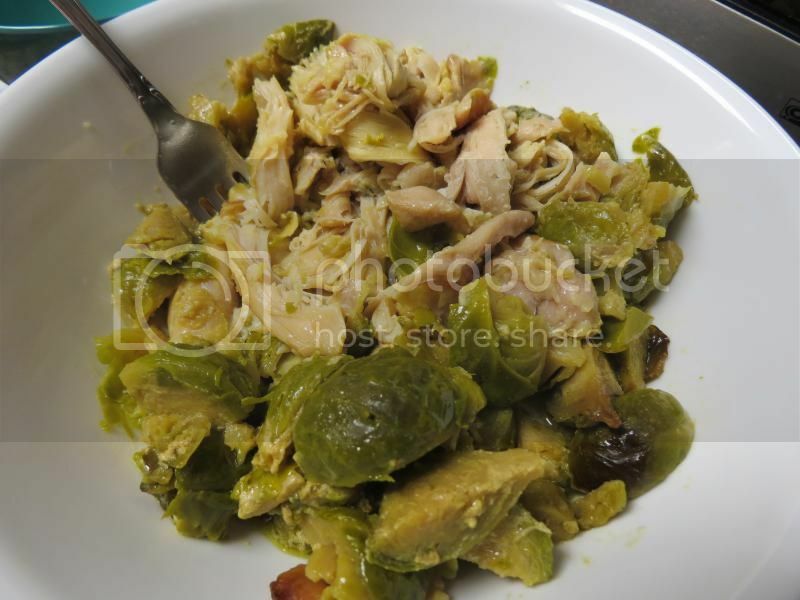 I made another recipe I had found on Pinterest: chicken with brussels sprouts. Simple, but delicious. There's no link on the Pin, but the recipe is given - based on the picture, though, I did things a bit different. I mixed the mustard with the water and oil, then tossed the sprouts in the mixture to make sure it was all evenly seasoned. Also, I subbed chicken thighs for chicken breasts because that's what I felt like when I popped it in the crock pot this morning. I liked it a lot, but Matt wasn't crazy about the brussels sprouts - I have yet to win him over on those, I think roasting them will do the trick. In the meantime, he ate his chicken, passed me his brussels sprouts, and had some berries instead. I put the second serving of sprouts away to have with my breakfast. Definitely looking forward to that - it was seriously really good! And with that, I am off to bed. I am a bit nervous about tomorrow, especially after receiving a ton of emails tonight after nearly a month of silence. Small problems with scheduling and whatnot for the Spring classes. It will all be resolved, no need for me to lose sleep over it. I have never thought to try eggs and tomato sauce together. I do like ketchup on my eggs and tomato sauce would be a lower sugar substitute. Does the sauce stain the bottom of your silicone cups? I received a set for Christmas and do not want to ruin them the first time I use them. Good luck getting back to work. Your meals look great and you're doing an awesome job. Go you! If you roast the Brussel sprouts, he will like them. It's like, science, I think. Happy to hear it's going so well for you! Big props to Matt for joining you in the journey! I KNOW Joel would super benefit from eating paleo! He has the faster metabolism EVER and is constantly hungry, but I think if I could get his system sustaining on fat, I could get him to gain some weight (he's on the opposite end of the spectrum where he can't gain weight even when he tries). I definitely find eating leftovers is key to lunchtime success... sometimes I would make something a little different at dinner for the next day, like if I was baking chicken, I would season the other breast for tomorrow a little differently to mix things up.